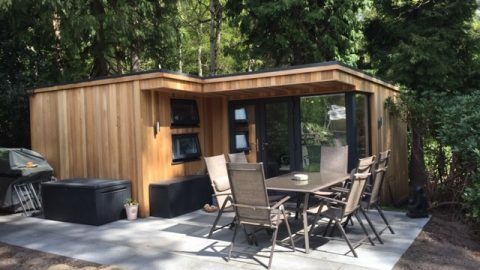 Modern Garden Rooms builds are not just sheds; they’re very sturdy and well insulated outdoor living spaces. 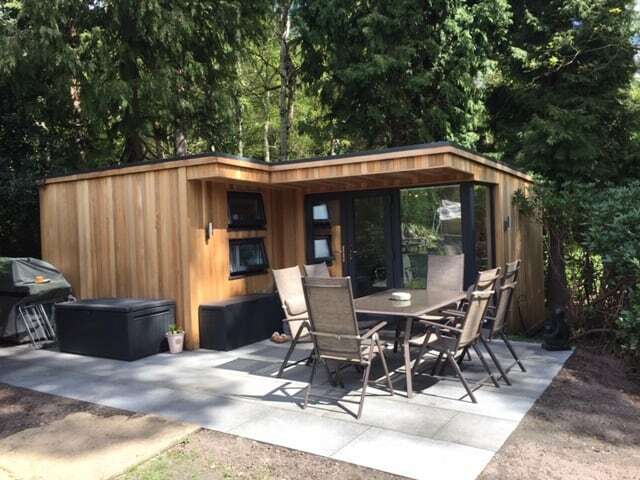 With the addition of heating, plumbing and electricity they can be used as temporary living space at any time of year. 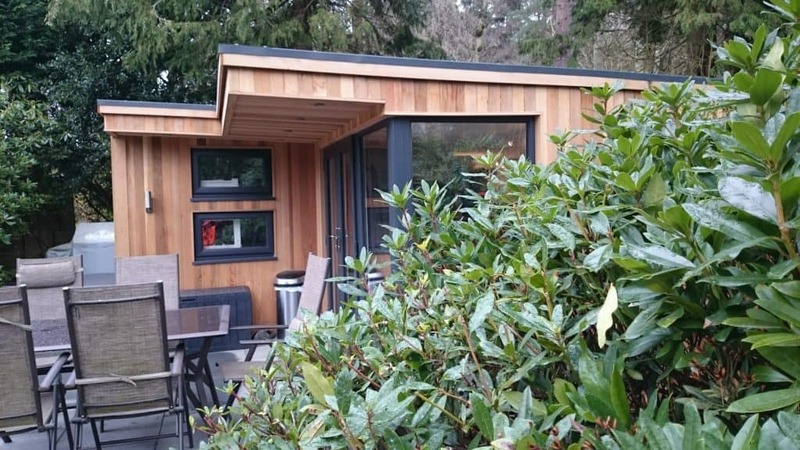 If you need somewhere for a family member to stay or a luxury private accommodation for visitors, then a new garden building could give you the space you need quickly, without breaking the bank or even requiring planning permission. 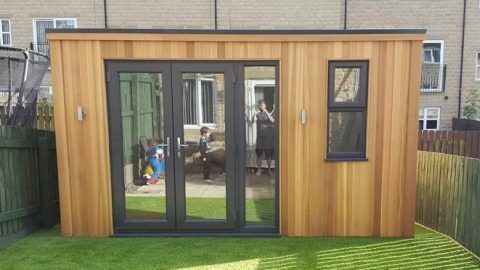 Your new stylish garden room could even be used as temporary living space for your family. Jonny from Cobham in Surrey faced a huge building project; the demolition of his family home and building of a new house. 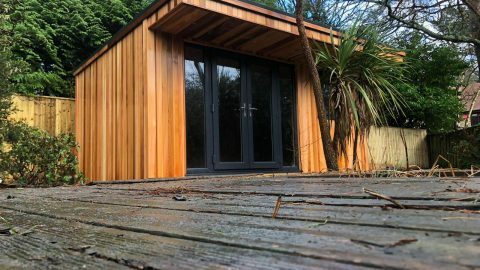 He approached Modern Garden Buildings about providing a temporary living space which would be suitable for his family to use as a base while the build was ongoing. 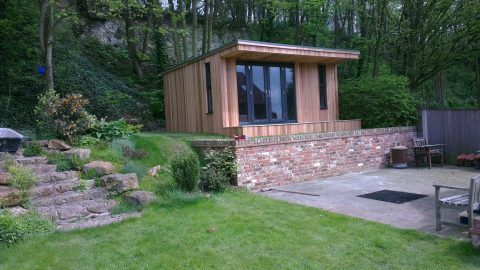 The room was a 6m x 6m L-shaped bespoke garden building with two internal doors creating three separate rooms. 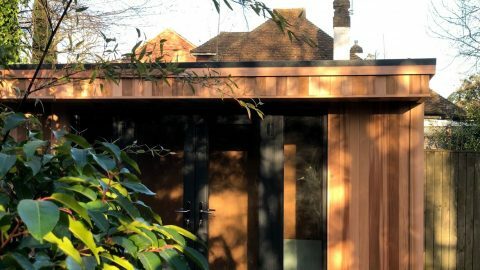 The striking cedar-clad garden room features a UPVC glass corner section and sliding “pocket” doors were used internally to save space. 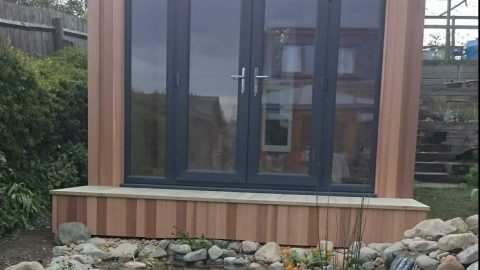 Jonny needed a multi-purpose garden building which could be used primarily as a temporary living space for his family whilst their house was demolished. It was then required to provide accommodation for the builders undertaking snagging of the family’s new house. 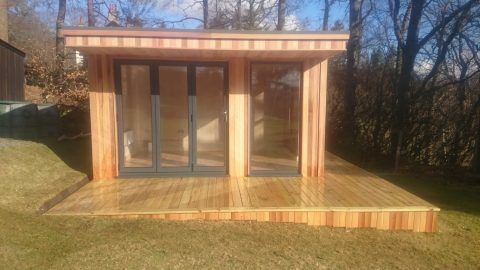 Finally once the build was complete, it would be put into use as a summer house, office and occasional accommodation for overnight visitors. The family would need a bathroom and a small kitchenette as well as space to sleep; not easy in a 6m x 6m space! 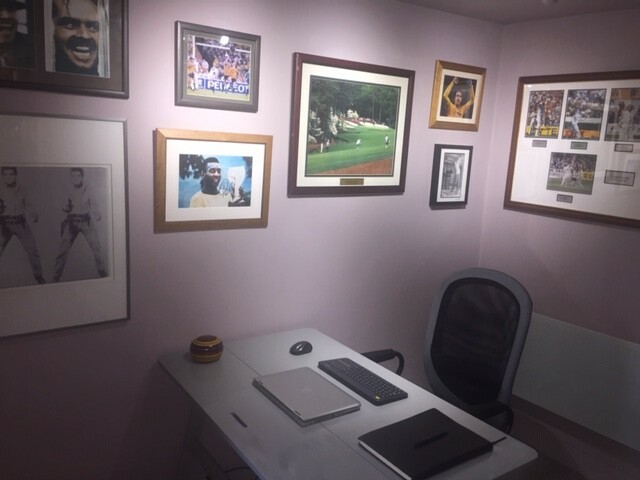 Johnny’s living space was an entirely bespoke build. 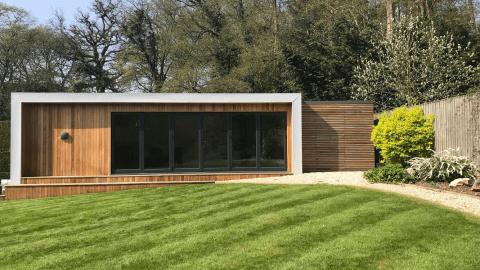 The room had an unusual L-shaped design and brought in elements of our cube and canopy buildings, with French doors and two large fixed windows to create a stylish UPVC and glass corner section. 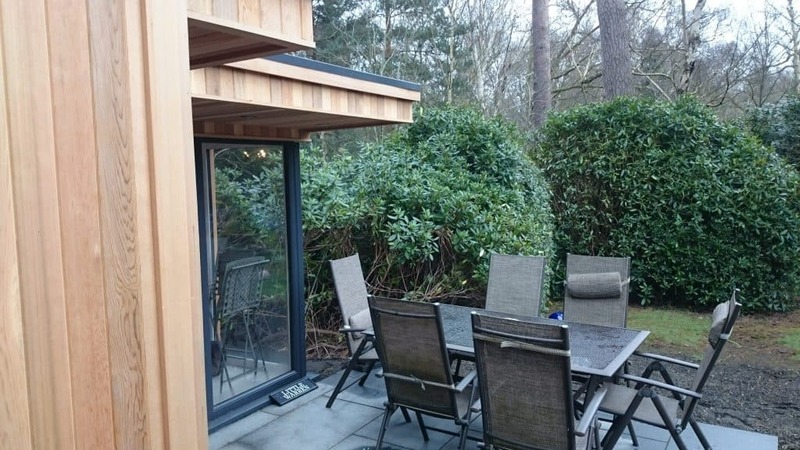 The garden room was built onto the existing patio with no need for decking, although a canopy with downlighting covered the entrance area. 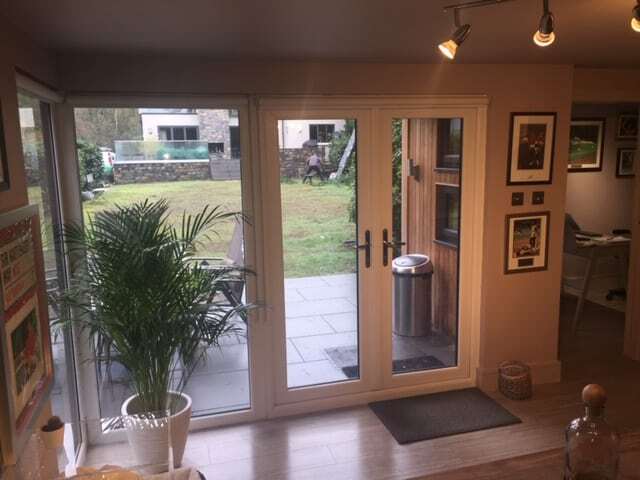 Inside, internal stud partitions were put in to create two additional rooms accessed via space saving sliding pocket doors. 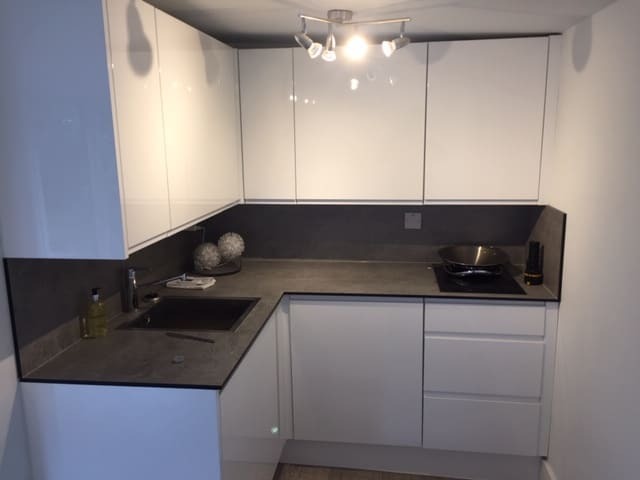 A small white gloss kitchen was installed and a bathroom put in by a local contractor. 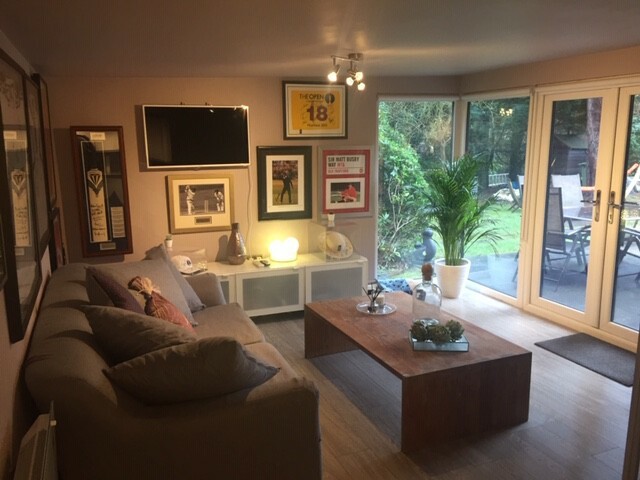 Now that Jonny’s house build is complete, the space is being used as a home garden office, as well as a place to relax and occasional overnight room for visiting friends and family. 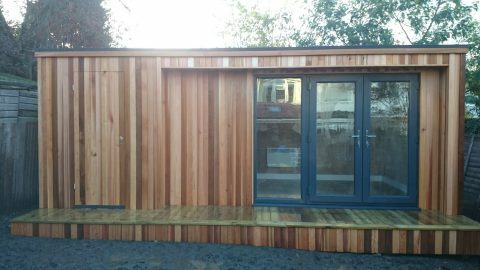 Are you looking for a garden building to provide temporary living space for you and your family? Contact us to see what we can do!